Spares for your legacy NetApp systems can get expensive fast. Zerowait can help. As the largest third-party supplier of NetApp, Inc. equipment, we have the part you need. From cables and memory to drives and head units, every component in our stock of compatible and refurbished equipment is tested twice - before it enters our inventory and before we ship it to you. If you are looking for a new system, our supply of off-lease systems are tested and ready to install at tremendous savings. Systems are available with transferable software licenses, or you can upgrade your existing systems. Know that you are buying from the most knowledgeable people in the business. Whether it is diagnosing a failure, specifying an upgrade or assembling a complete system, our engineers and sales people can help you get the most from your NetApp investment. Since our mission is providing you with the RIGHT solution, rather than the latest-and-greatest, we can tell you the truth about what works and what doesn't and offer the most cost-effective way to get the storage and performance you need. 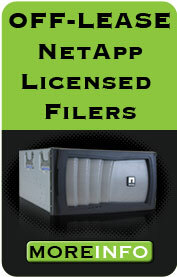 Zerowait has complete NetApp, Inc. filer and NetCache systems in stock and ready to go. Many systems have transferable licenses for NFS, CIFS and Cluster software protocols. If you are upgrading an older system, you may be able to use your existing licenses, adding additional savings. If you want a system to keep as a cold spare, our systems without licenses are a quick, inexpensive alternative to standard spares kits. Upgrades can be as simple as purchasing additional drives and shelves, or as complex as upgrading the head unit to gain more capacity and performance. One of the most cost-effective upgrades is to swap low-capacity drives for higher-capacity units, allowing you to optimize your head and shelf investment. For additional ideas and solutions, check our online store or call us for all your upgrade needs. Zerowait's standard warranty is 30 days replacement or repair, with a no DOA guarantee. We can provide extended coverage for one to three years under a Zerowait Parts Assurance (ZPA) Policy. How many corporate partners does your department have that can say they have been providing High Availability service and support for two decades? Zerowait can, and we have the record and references to prove it. Data storage is at the heart of most federal systems, and we understand that access to your records and databases is critical. We recognize that you have a limited budget with which to manage and support these systems, and our products and services are designed to provide the maximum return on your storage dollar. Zerowait is the recognized leader in providing legacy support services for mission critical NetApp data storage equipment. Our engineers are monitoring and helping to maintain systems for many civilian and military installations every day. Our clients know that they are getting the best service and support available while stretching their limited budgets. Today's High Availability storage has both the performance and reliability to go much further than the typical 3-year cycle. With our legacy support and demo/off-lease parts and systems, we can help you get many additional years from your storage investment. Unlike the OEM, we're a support company, not a sales company. So rather than push unnecessary upgrades, we'll help you squeeze every last dollar out of your current hardware. Zerowait has earned its reputation as a trusted partner by providing outstanding service and support for customers over the long run. We appreciate the trust customers have placed in us and work every day to make certain that our customers go to sleep secure in the fact that they are covered by Zerowait Parts Assurance (ZPA). They don't have to worry about their systems and support; they know we'll be there when they need us.